Lawrence Cherono, of Kenya, holds the trophy after winning the 123rd Boston Marathon, on April 15, 2019, in Boston. 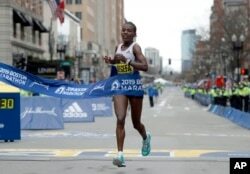 Worknesh Degefa, of Ethiopia, breaks the tape to win the women's division of the 123rd Boston Marathon on April 15, 2019, in Boston. "Seeing Degefa go out — you know her ability, you know what she's done and you wonder how it translates to this course," Linden said. "But when she starts putting down those super quick miles, you say `All right, this is her race to lose.' She becomes the outlier and you let her just go and hope that she might come back." Kenneth Kipkemoi (L) of Kenya, Lelisa Desisa (C), of Ethiopia, and Lawrence Cherono (R), of Kenya, compete in the final mile of the 123rd Boston Marathon on April 15, 2019, in Boston. "I was afraid of the guy who won two years ago. After he dropped out, I decided to win," said Desisa, who did not finish in either of the last two years. "I tried at the last, I saw [Cherono] suddenly, then I couldn't control the pace." "I was just really happy that the weather turned out to be actually really nice," said Schar, who set a course record in 2017. "When we drove to that starting line, it looked really really bad and I was worried because last year was still in our heads, and I had a really bad experience last year. Today I would say [was] unfinished business."